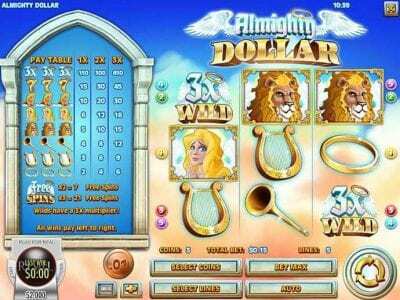 Welcome to the Almighty Dollar slots review. 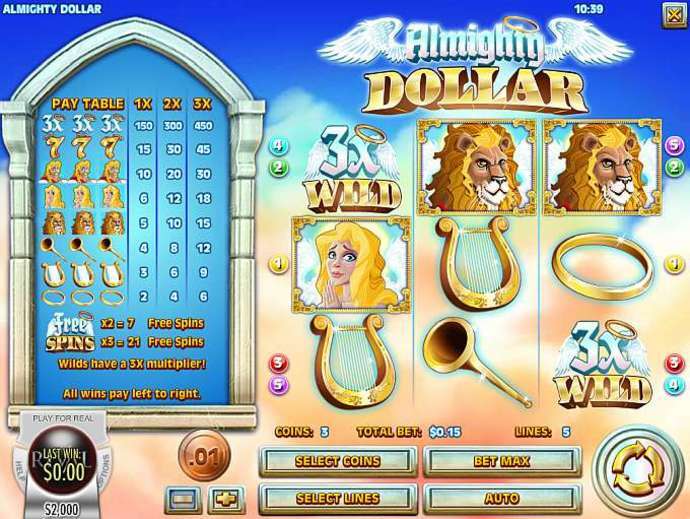 In this review, we are going to tell you the pros and cons of playing this classic slot machine. First of all, Rival Gaming releases this game in April of 2018. With big technology advances, Rival launches this game and paves the way for amazing gaming experiences on mobile Smartphone’s, tablets and personal computers. Furthermore, this casino game features 3 Reels with five pay lines. However, this is not a typical fruits and bars vintage Vegas game. Rival does a great job with the graphics of this fantasy/mythology theme slot machine. Specifically, look on the reels to see the dollars feature with heavenly angels. Before you start to play Almighty Dollar, you will see soft clouds in the background. Along with these soft clouds are two angels that are shining their good fortunes upon you. Additionally, you should see a winged lion that stands guard of the two angels with halos. If you are lucky enough to score trumpets, 3X wild icon, harps, or divine 7’s, you may trigger the free spins bonus round. More specifically, you win 7 freespins if you to score 2 of the free spin symbols. If you hit three of them, you will earn 21 free spins! Additionally, when you score a win, you will hear a chorus of angles raising up. Ultimately, the sound effects are soothing and not intrusive. Obviously, there is nothing unbelievable about this 3 reel, 5 pay line slot machine. However, low and high rollers can enjoy this game. Start your bets with as little as one penny. After you feel comfortable, you can increase your wagers up to 75 coins. Additionally, select anywhere from 1,2,3,4 and 5 pay lines to play with. As a result, the most you can bet is 375 coins. While some people like very high or low volatility games, this falls in the medium category. Also, when comparing the wins to other Rival games, they are not as big. The highest paying icon pays between one hundred fifty and four hundred fifty times your wager. While this is a decent win, other Rival games have bigger multipliers. Having said that, the Almighty Dollar slot machine doesn’t offer life-changing wins. Cosmic Quest. Plunk-Oh. Rock On. To be upfront, this game does not have great bonus rounds with special features. We like this game and feel Rival did a great job making this classic slot machine. However, we feel they could have made the game with bigger wins and more features, including bonus games. Ultimately, the best part of this game is landing the 3X wild symbol.